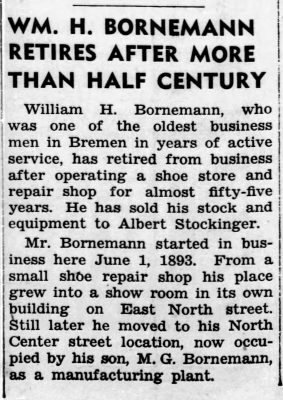 William Bornemann came to Bremen to start a shoe-making business in 1893. 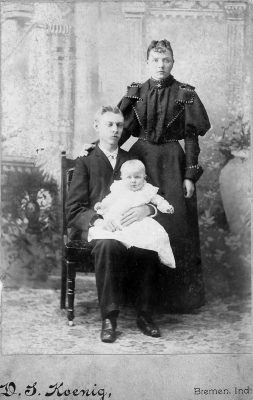 He had been born in Westphalia, Prussia, in 1870 and emigrated in 1888. 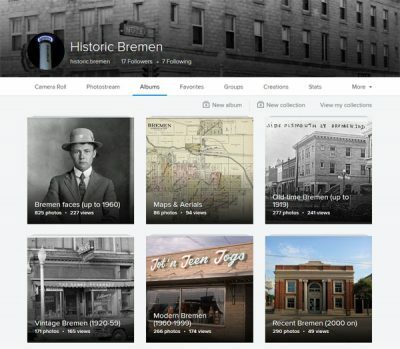 He married Elsbeth Saenger, another German immigrant he met by arrangement in South Bend. 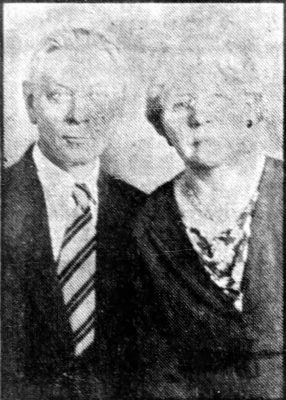 They had four children: Meta Schafer, Emma Lou Boulter-Wiedenfelt, Elsbeth—who became an invalid and died at 37—and Gerhard. Gerhard assisted his father as the shoe making and repair business grew. 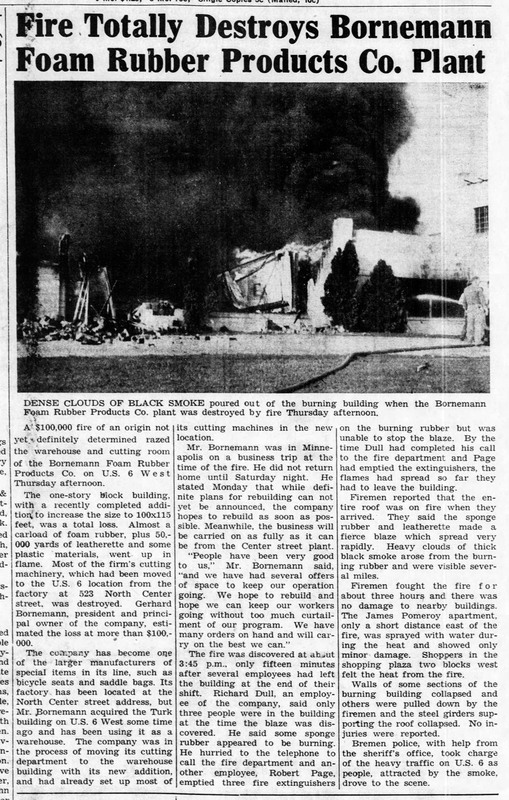 The Bornemann’s variously had shops on W Plymouth St, E North St, and N Center, finally settling into a new building they built at 121 N Center (now Edward D Jones financial planning) and buying the defunct overall factory at 523 N Center. 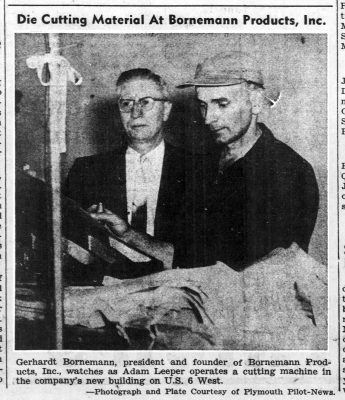 William retired in 1948, shortly after Gerhard founded Bornemann Products in 1946 and began making foam rubber and vinyl products such as bicycle seats, portable cushions for bleachers, and beanbag chairs. Gerhard moved the business out to US 6 after purchasing the Turk Corporation building on the little hill and using it as a warehouse for a time. Then, in the fall of 1960, some foam rubber caught fire during a shift change, and the building burned to the ground. 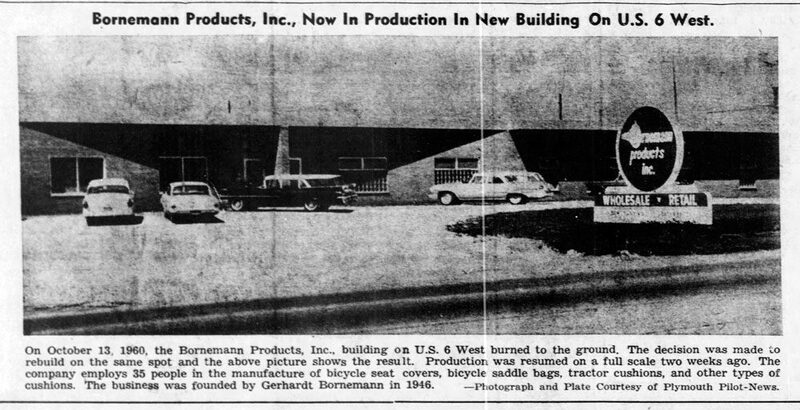 By the next May, Bornemann’s had rebuilt and so remained for a couple of decades, making foam and vinyl products and book and gym bags. The location is now Southwire.